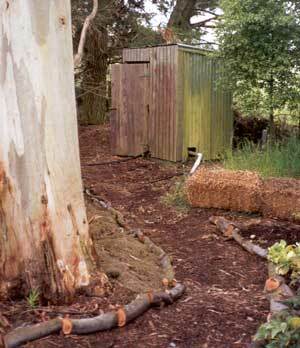 The pump house sits on the fence-line behind the pond surrounded by gum trees. The ground is often covered with gum debris - strips of bark and leaves from the high Eucaluptus trees. In the early days I would walk back around the pond, and would keep tripping over old branches lying in the long grass. The idea of a path which looped around the pond was appealing, and one weekend I set to work clearing the old logs and raking out the rubbish. I had been worried by the lack of secrets in the garden - the paths were all functional, and their destinations were clear to see. So I decided to leave the Pump House path with a little bit of mystery - for the moment the long grass either side is to stay, and you can't see exactly where the path is leading. Things are more organised (and pleasant) where the path joins the Wattle Woods. At the moment there are chopped log edges, and hellebores have been moved in to drape over these. Grass clippings and compost are spread pond-side, and the self sown Pittosporums left to fill in the gaps. The sound of the water running into the pond has made working here very enjoyable - this might be a good spot for a restful shady seat. The cats and the dog (who are my consumer testers) use the new path happily and confidently. They are efficient walkers, keeping strictly to the cleared earth, not tempted to any short cuts. A fork is planned, with a new route moving up the fence-line. This area behind the pond, once forgotten, is now part of my cat walking circuit. I've even bought visiting people here, who are delighted by this slightly wild ambience. Finally I have created my first wild wandering path, with secret corners to peep around and to wonder about. After the heady early days chronicled above, the Pump House path fell into a state of disuse and disrepair. Then in the Autumn of 2004, my first such season as a semi-retired gardener, I seemed to find the time for a total clean-out! Now all the messy grass is completely gone. 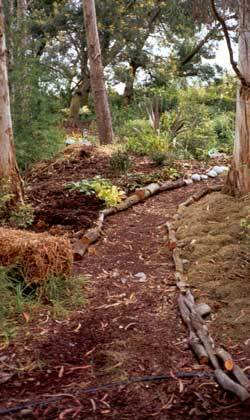 I'm waiting to plant some evergreens like Pittosporums, letting the route of the path be defined by plants rather than the ubiquitous stones or logs of wood.